﻿ Biogas Utilization_Products & Services_Jereh Combined Energy Co., Ltd.
Biogas, produced by the anaerobic fermentation of organic matters, is the metabolite of methane bacteria. It is a mixture of gases, mainly consisting of methane (50%~70%) and carbon dioxide, with small amounts of nitrogen, hydrogen, hydrogen sulfide, etc. Its characteristic is similar to natural gas. Anaerobic fermentation is a high-value method to process the organic matters produced in agriculture, food industry and feed processing. Biological waste from fruit product factory and winery (30), biological waste from dairy factory (30), and biological waste from fiber industry or sugar refinery (40-60). The gas mixture in fermentation tank consists of 50% - 70% methane (CH4) and 30%-50% carbon dioxide (CO2), which makes biogas a premium fuel for gas engine. The residual after fermentation can be used as fertilizer. 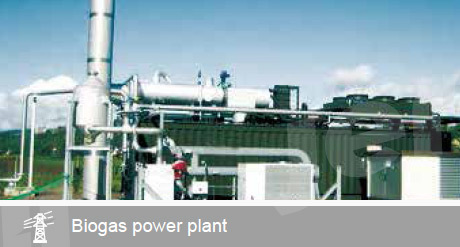 Electric energy is available to treatment plant and the public power-supply system, and heat energy is available to heat the fermentation tank or other facilities. The residual in fermentation tank can be used as high-quality agricultural organic fertilizer.